Below are common attributes associated to Jubilation Gardenia. Become a care taker for Jubilation Gardenia! Below are member comments regarding how to plant Jubilation Gardenia. No comments have been posted regarding how to plant Jubilation Gardenia. Be the first! Do you know how to plant Jubilation Gardenia? Below are member comments regarding how to prune Jubilation Gardenia. No comments have been posted regarding how to prune Jubilation Gardenia. Be the first! Do you know how to prune Jubilation Gardenia? Below are member comments regarding how to fertilize Jubilation Gardenia. 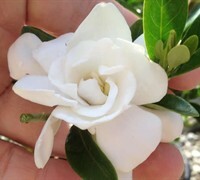 No comments have been posted regarding how to fertilize Jubilation Gardenia. Be the first! Do you know how to fertlize and water Jubilation Gardenia? Below are member comments regarding how to deal with Jubilation Gardenia's pests and problems. No comments have been posted regarding how to deal with Jubilation Gardenia's pests and problems. Be the first! Do you know how to deal with pests and problems with Jubilation Gardenia? Get Jubilation Gardenia fresh and large directly from the grower to your garden! Buy Jubilation Gardenia online from the nursery wholesalers and save BIG! Jubilation gardenia performs best in sites that provide well-drained soil and full to mostly sun, however they will tolerate a fair amount of shade. In colder regions, plant gardenias where they will have protection from severe winter winds, such as the east or south side of a home, building or other structure. Since gardenias are highly fragrant consider planting them near windows or outdoor living areas such as decks, patios, and porches, where their fragrance can be enjoyed. That being said, Frost Proof gardenia is known to be the most cold hardy gardenia. To plant, dig a hole no deeper than the root ball and two to three times the width of the root ball and fill it with water. If the hole drains within a few hours, you have good drainage. If the water is still standing 12 hours later, improve the drainage in your bed, perhaps by establishing a raised bed. Turn and break up the soil removed from the planting hole. Mix some organic compost if the native soil is clay or compacted soil. Remove your plant from its container and carefully but firmly loosen the root ball. Set the plant into the hole you've prepared, making sure the top of the root ball is slightly above the soil level. Pull your backfill soil mixture around the root ball in the hole, tamping as you go to remove air pockets. Then water thoroughly and cover with a one to two-inch layer of mulch. Gardenias requires no pruning. To Maintain shape prune in late Winter before new growth emerges. Cut with hand pruners and not powered trimmers to avoid scarring leaves. Gardenias do not require pruning though they respond well to it. Prune as desired after the plants have bloomed. Older gardenias that have become spindly respond very well to rejuvenation pruning, which involves cutting the plant back to 6 to 12 inch stumps. Gardenias prefer an acid soil with a pH in the range of 4.5 to 6. I fertilize gardenias after they've bloomed with a well-balanced shrub & tree type fertilizer that includes a micronutrient package containing iron and/or sulfur. If the foliage on your gardenia develop chlorosis (yellowing of leaves) due to soil that is too alkaline you can apply additional amounts of chelated iron and/or soil sulfur to lower soil pH, making it more acidic. The two problems I've seen with gardenias involve insects and damage from severe cold. In areas that experience cold temperatures, plant gardenias where they will receive some protection from sever cold winds, such as on the east or south side of a home, building or other structure. On occasion, gardenias can be visited by honeydew aphids or whiteflies. Honeydew aphids usually come in late summer and don't hang around too long. They don't do much damage but leave a sticky residue on the leaf that turns black over time. Aphids can be controlled with neem oil or malathion spray. To control whiteflies, spray with malathion and then again in 72 hours to eliminate hatchlings. When spraying any chemical always read and follow instructions on the product label.